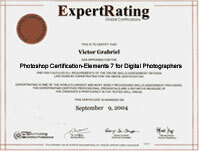 (leading to ExpertRating Photoshop Certification-Elements 7 for Digital Photographers). In this Adobe Photoshop class (Elements 7), you'll learn the secrets to successfully edit photos and bring out the best in your images! An award-winning package designed for photo enthusiasts, Adobe's Photoshop Elements 7 provides the tools for making both quick fixes and detailed improvements. Perfect for those with no image-editing experience, this course will take you from novice to accomplished user. Upgrade Photoshop students are welcome as well! You'll experience editing images on your computer, correcting flaws, enhancing the final product, creating simple art projects, preparing images for e-mail and the Web, and more. You'll achieve high-quality results with your images without having to learn complex professional photoshop techniques. And you'll see how Photoshop Elements 7 gives you room to grow while making it easy to achieve amazing results even in the early stages of your learning. So get ready to unlock the mysteries of Photoshop Elements 7. The hands-on, easy-to-follow photoshop exercises in this course will leave you with a great feeling of accomplishment! About the ExpertRating Online Photoshop Course (Elements 7 for Digital Photographers) instructor: Dr. Beverly Schulz is a freelance photographer and a graduate of the New York Institute of Photography's Professional Photographer's program. She teaches a number of classes in digital photography and has more than 25 years of classroom instruction experience. Her writing and photography have been published in a number of magazines. She has traveled extensively and participated in onsite photography workshops as well as independent photo quests. In addition to teaching and photographic work, she provides consulting services for digital photographers and clients. Online Photoshop Tutorial Course requirements: Photoshop Elements 7.0 for Windows (please be sure to install this software on your computer before the course begins); Microsoft Windows Vista or XP; Internet access; e-mail; and the Microsoft Internet Explorer or Mozilla Firefox Web browser. Note: Adobe does not currently offer a Mac version of PSE 7.0—this class is designed for Windows users. "I am very happy that I took this Photoshop class - it has already been helpful. I now feel like I can get my money's worth out of the Photoshop Elements program. Instead of just "wandering about," I now can get some results!!! Thanks a bunch!" "Most enjoyable Photoshop course. I am a self-taught PS Elements user who had used books and "jumping" in to learn previous versions of the program. This Photoshop course was very, very helpful in getting the most out of this program. Thanks!" "The Photoshop course was very informative and interesting. I learned how to use the program in a way that was interesting and fun. I would strongly recommend it to anyone who wants to improve or play around with their pictures." "This Photoshop course gave me a good start in learning PSE 7. It also provides a nice reference to return to as I continue exploring the program. I'm looking forward to taking part 2." "This course is excellent in that it takes the mystique out of this complicated subject. The conversational tone is just what is needed to explain the concepts without sounding too technical, which can be a turn-off for anyone trying to learn photo editing." "This is the first online Photoshop course I have taken and enjoyed being able to go through things at my own pace. I thoroughly enjoyed this course. The explanations and instructions were very clear and easy to follow, and…the lessons were downloadable. I certainly learned a great deal and look forward to taking the advanced course in the future." "Wonderful class!!! It fulfilled my expectations 100%! It was wonderful to get such detailed instructions and to have answers readily available for any roadblocks we might encounter - however big or small. Thank you so much for helping me understand this program better!" ExpertRating is one of the world's only ISO 9001:2015 Certified companies (from TUV America) offering an Online Photoshop (Elements 7 for Digital Photographers) Course (leading to ExpertRating Photoshop (Elements 7 for Digital Photographers) Skills Certification). When you choose the ExpertRating Online Photoshop Course (Elements 7 for Digital Photographers) you can be sure that you are buying a premium International certification that is recognized by hundreds of employers and Government bodies in the US and other countries. With ExpertRating you get certified quickly online and you are equipped with a store house of information through the in-depth ExpertRating Online Photoshop Course (Elements 7 for Digital Photographers) Courseware which has been developed by experienced Photoshop Training Experts. The ExpertRating Photoshop Tutorial Certification is by far the best value for money instructor led Photoshop Tutorial Program at $129.99. How much does the Photoshop Tutorial Certification cost and what does it include? You can buy this ExpertRating Online Photoshop Course (Elements 7 for Digital Photographers) leading to Photoshop Tutorial certification at a special offer price of only $129.99 which includes the in-depth ExpertRating Online Photoshop Course (Elements 7 for Digital Photographers) Courseware and exam fee. This is the best value for money Photoshop Tutorial Program available till date. You get the following services within the USD $129.99 fee. In-depth ExpertRating Online Photoshop Course (Elements 7 for Digital Photographers) Courseware including scenarios and case studies. World wide airmail delivery of the hard copy Photoshop Tutorial Certificate. The Photoshop Tutorial Certificate can be used to prove your certified status and does not mention the words "online". The process of getting yourself certified is very simple. All you have to do is buy the ExpertRating Online Photoshop Course (Elements 7 for Digital Photographers) for $129.99. Log in to the instructor led course using your password. Go through the ExpertRating Online Photoshop Course (Elements 7 for Digital Photographers) Courseware (which would take you 6 weeks) and complete the final Photoshop Tutorial Certification exam at your convenience. You can complete the exam within 2 months of buying the Photoshop Tutorial Certification. The result of the exam appears as soon as it is completed, and your Photoshop Tutorial Certificate is mailed immediately. Chapter assignments to help you practically use the Photoshop skills that you will learn during the Photoshop Tutorial Course. The final exam is fully based upon the ExpertRating Online Photoshop Course (Elements 7 for Digital Photographers) Courseware that is provided along with the Photoshop Tutorial Certification. If you have gone through the courseware properly you should not have a problem clearing the exam. The exam consists of multiple choice questions from all chapters of the ExpertRating Online Photoshop Course (Elements 7 for Digital Photographers) Courseware. According to the US Bureau of Labor Statistics, employment of digital photographers is expected to grow about as fast as the average for all occupations through 2016 and Photoshop Elements 7 is a boon for the digital photographers. Adobe Photoshop, or simply Photoshop, is a graphics editing program developed and published by Adobe Systems. Photoshop Elements 7 is the current and primary market leader for commercial bitmap and image manipulation. Photoshop has been described as "an industry standard for graphics professionals”. This course contains essential techniques of the program - color and tonal adjustments, layers, transformations, selecting, and masking. The ExpertRating Photoshop Elements 7 for the Digital Photographer Certification course is a great way to enhance your resume by empowering you to do more efficient and effective editing, processing, and file handling. Photoshop Elements is an excellent package for photographers to enhance and edit digital images. In our first lesson, we'll discuss online training, go over how to download the images you'll use in this course, and start with the very basics of Photoshop Elements. We'll take things one step at a time so that even if you're a new user, you'll have no trouble getting comfortable editing and enhancing your digital photos. We'll also talk about what's new in Elements 7. Discuss the many file formats digital images can take and how you can use them to your best advantage with Photoshop. You'll learn how to save updated originals and copies of your images, and how to use Quick Edit to produce fast results. You'll see how to crop and rotate images to get just the look you're after, and you'll practice using the Straighten tool for one-step corrections. Digital images come in all sizes! In this lesson, we'll discuss image resolution, pixels, and recommendations for resizing pictures with excellent results. Whether you want to create flawless prints or send your photos quickly by e-mail, you'll learn how to optimize your images for the best results. You'll see how the Crop tool, Options bars, and a 3:2 ratio can change the look of your pictures. Photoshop Elements gives you lots of options for printing your documents, and you'll learn about all of them in this lesson. You'll find out how to add temporary colorful borders and how to print images to just the size you want. You'll also practice saving photos for use on the Web using Photoshop Elements' Save for Web feature, and you'll have a chance to try out the new Photoshop.com Web site for Adobe users. In addition, we'll look at the Organizer and see how to print multiple photos on a page. Most of the time, photographers have plenty of images to work with, but in some instances you'll want to create a new file as a foundation for your images. You'll learn how to do that in this lesson. From there, you'll add color and then move a photo onto your background. You'll discover how to use the Layers feature in the process. Have you ever wondered how professional photographers can make the colors in some images look out of this world? Find out how they do it! You'll work with color adjustments in your images, including hue and saturation. You'll also create black-and-white images from color images using Elements' Black and White Conversion feature, and you'll pick individual colors to replace with others. Color Variations is a wonderful visual tool included in Photoshop Elements. You'll learn how to make quick changes with it! Light is the essence of photography, but it's not always cooperative. In this lesson, we'll discuss ways to enhance and even create better lighting after you've taken an image. You'll see how to use Brightness and Contrast to improve your images, and we'll cover techniques for lightening shadows. You'll also have a chance to work with the histogram, Levels, and Color Curves—all excellent tools for correcting lighting and color tones. Through all this, you'll see how Photoshop Elements keeps track of your changes and lets you go back through them if you want to undo something. Adobe includes Organizer, a powerful organization package, with its industry-standard editor, Photoshop Elements. Take a look at how Organizer works to keep track of your images. We'll also cover strategies for using both folders and Organizer, as well as connecting with Photoshop.com online. You'll see how to sort your pictures, add tags, and collect them for use in projects like scrapbook pages and greeting cards. Creative projects often pair photos with text. Photoshop Elements gives you plenty of text tools, and in this lesson, you'll explore those and add text to your images. You'll see how Photoshop Elements uses layers with text, and you'll get tips on how to master the Layers palette. You'll also begin your study of the powerful selection tools, including the color-based Magic Wand tool and the flexible Lasso tool. With these, you'll discover the power of Feathering selections and copying selections within an image. As you continue your study of selection tools, you'll learn how to create a silhouette image using the Quick Selection tool. You'll also practice using any of the selection tools in a reverse mode for tricky selections. We'll see how the Marquee tools let you select perfect squares and circles for use in framing and highlighting your images. You'll also work more with Feathering and see the difference it makes, especially when you want to create a soft, blended background in your image. Finally, we'll go over how to add colors with the Gradient tool. In this final lesson on the selection tools, you'll work with the Selection Brush tool, discovering how you can do detailed and exacting work. You'll also learn some advanced techniques for using the selection tools together. We'll work extensively with the Add to selection option, and we'll preview our work with Mask Mode. You'll have a chance to experiment with some of Photoshop Elements' filters and color options, as well as the settings in the Magnetic Lasso tool. As a final addition to your knowledge in this area, you'll have a chance to explore and work with each item on the Select menu. We'll finish the course by discussing the Retouching and Correcting tools, and you'll perfect your skills with the Red Eye tool, the Clone Stamp tool, and both the powerful Healing Brushes. You'll learn when to use each tool for the best results. The power of Photoshop Elements will come to life as you use these tools in your final assignments.